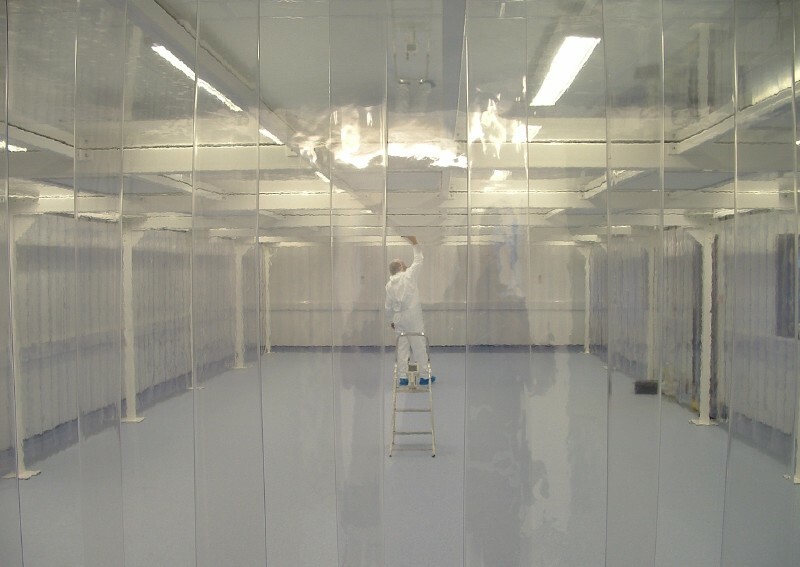 Softwalls are the most economical type of modular cleanroom wall construction. Clear and flexible panels are mounted onto a robust, steel frame, enclosing the clean area. The PVC or Polysim™ panels overlap to ensure the walls of the softwall cleanroom are effective barriers when in position. The positive airflow pushes air down through the cleanroom, allowing particles to be flushed out through the low level exhaust vent. For large scale softwall cleanrooms, we recommend a mid-height rail to control access. This non-outgassing material is made by Simplex from an inherently static dissipative urethane that provides permanent, non-humidity dependent ESD protection for sensitive manufacturing conditions such as computer disc drives, microelectronics and aerospace. There is no plasticizer used in Polysim, making the volatile condensable contaminants extremely low. Because Polysim is an alloy using high molecular weight materials, the static dissipation properties are permanent. Polysim is also Class 1 fire rated per flame spread and smoke test. Manufacturing, engineering, food, plastics, printing aerospace and many more applications.